"Freeman Dyson ... When Prime Minister James Callahan made his statevisit to Moscow hehad two amicable meetings with Chairman Leonid Brezhnev. 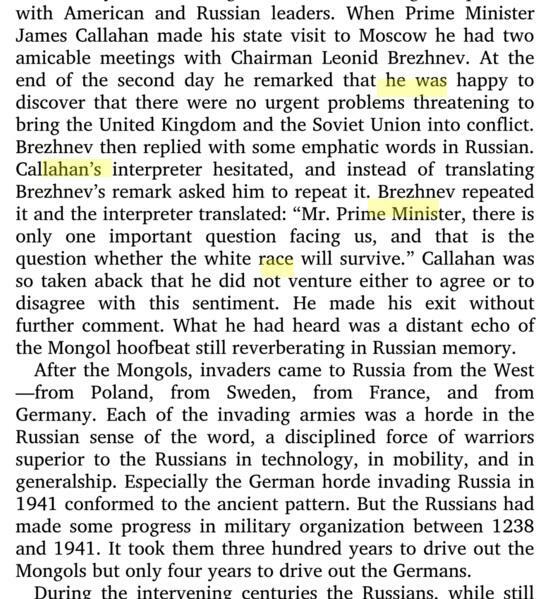 ... Callahan's interpreter hesitated, and instead of translating Brezhnev's remark askedhimto repeat it. ... interpreter translated: “Mr. Prime Minister, there is only one important question facing us,and thatis the question whether the white race will survive." When the boom is over you might want to have a railroad rather than a pipeline.